Bladez’s flagship elliptical, the Bladez Fitness E700i is an extremely smooth and quiet elliptical trainer with plenty of workout programs and resistance levels to keep you motivated. The Bladez Fitness E700i Elliptical Trainer features 26 built-in programs for variety and 24 levels of electronically controlled magnetic resistance for a great range of intensities to suit all ages and fitness levels and to keep your workouts progressively challenging. 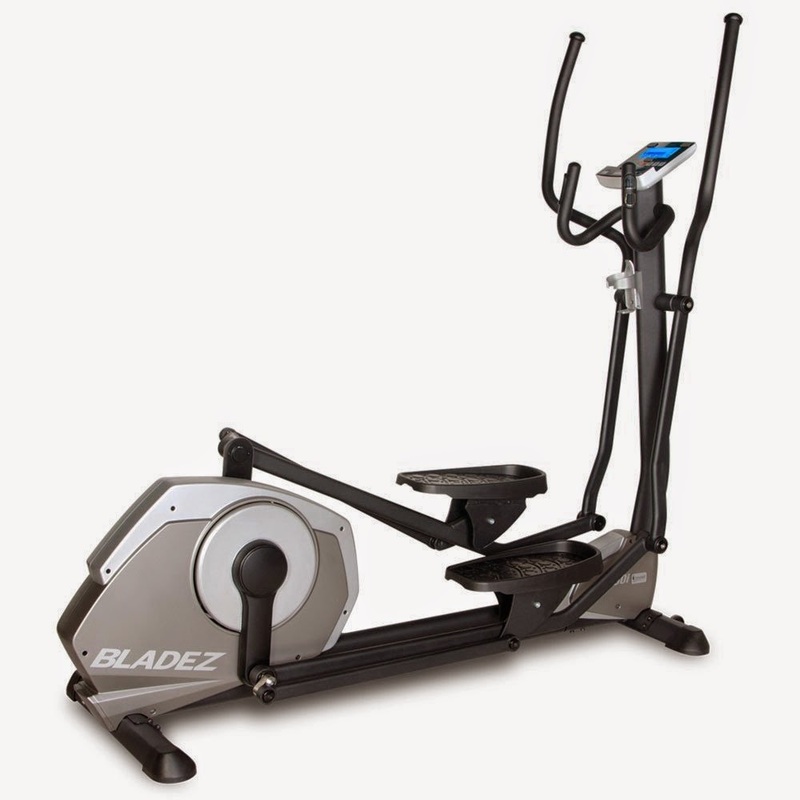 In addition, the top-of the range Bladez E700i utilizes iConcept Technology which enables you to download apps and additional workout programs to a mobile device for interactive training and entertainment, effectively giving you endless workout options, which none of the other Bladez elliptical trainers have. The Bladez E700i offers a 20” stride length coupled with a narrow Q-factor for a natural and comfortable low-impact workout. The 20lb heavyweight flywheel gives a smooth and consistent momentum while the magnetic resistance provides for smooth and quiet operation. The Bladez E700i elliptical trainer comes with a large easy-to-read blue-backlit LCD display, showing motivational workout feedback such as time, speed, distance, calories burned and heart-rate. 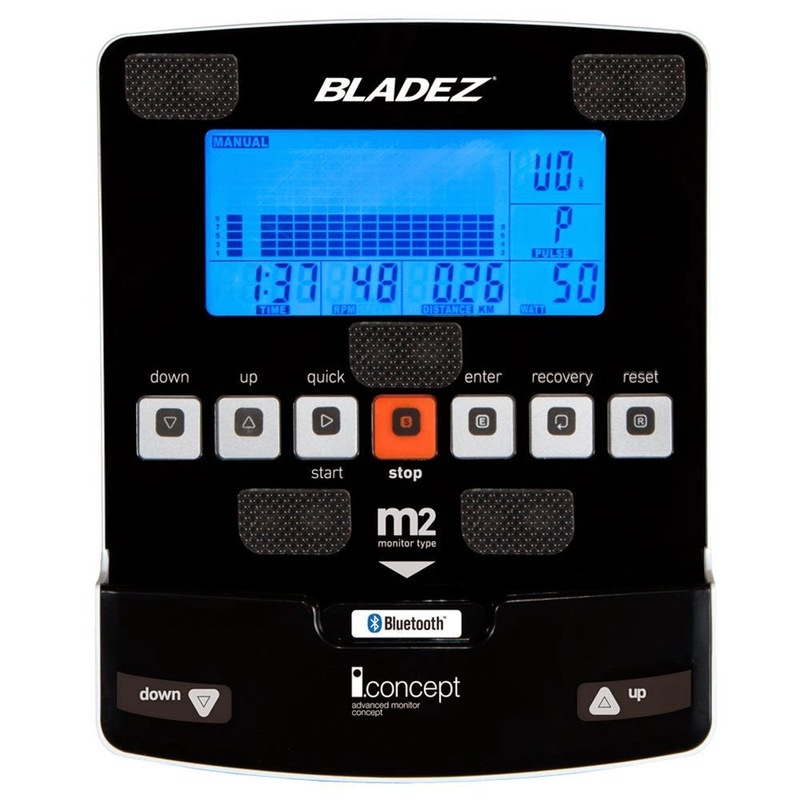 The Bladez E700i is ergonomically designed for a comfortable low-impact workout, with large articulating foot plates and thick padded ergonomic handles. Useful tip: A 30 minute workout on an elliptical trainer could burn approx. 310 calories for women or 378 calories for men, depending on the intensity of your workout. N.B. It’s always advisable to consult your doctor or health care professional before undertaking any new exercise regime. Prices/discounts indicated are correct at time of writing/publishing. E&OE. Comparing Nautilus MY18 E618 versus Nautilus MY18 E616 Elliptical Trainer, What's the Difference? Comparing Nautilus E618 versus Nautilus E616 Elliptical Trainer, What's the Difference? Comparing Nautilus E616 versus Nautilus E614 Elliptical Trainers, What's the Difference? Schwinn 430 versus Schwinn 470 Elliptical Trainer Machine, What's the Difference? Schwinn 470 versus Sole E95 Elliptical Trainer, How do they Compare? Comparing ProForm Endurance 720 E versus ProForm Endurance 520 E Elliptical Trainer Machine, What's the Difference? Comparing LifeSpan E2i versus LifeSpan E3i Elliptical Cross Trainer, What's the Difference? Comparing Horizon Fitness EX 69 2 versus Horizon Fitness EX 79 2 Elliptical Trainer, What's the Difference? Comparing Exerpeutic 5000 versus Exerpeutic 4000 Magnetic Elliptical Trainer with Double Transmission Drive, What's the Difference? Comparing ElliptoGO 3C versus 8C versus 11R Outdoor Elliptical Bikes, What's the Difference?